What a variety of sailing locations we have been lucky enough to experience this year in Carra’s voyage from the UK to Sweden. From anchoring in Durgan Bay in the Helford River being watched by a curious dolphin – to hanging off a rock in Trakso Storo in the stunningly beautiful Stockholm Archipelago. We have had some cracking sails though also had to motor a fair bit more than we would have liked. Poor Peter and Chris had absolutely no wind so had to motor from Falmouth to the Dutch coast and then had too much wind to the mouth of Elbe just before the Kiel Canal. Our best experience: Seeing Carra in the British Kiel Yacht Club and all the memories it evoked. 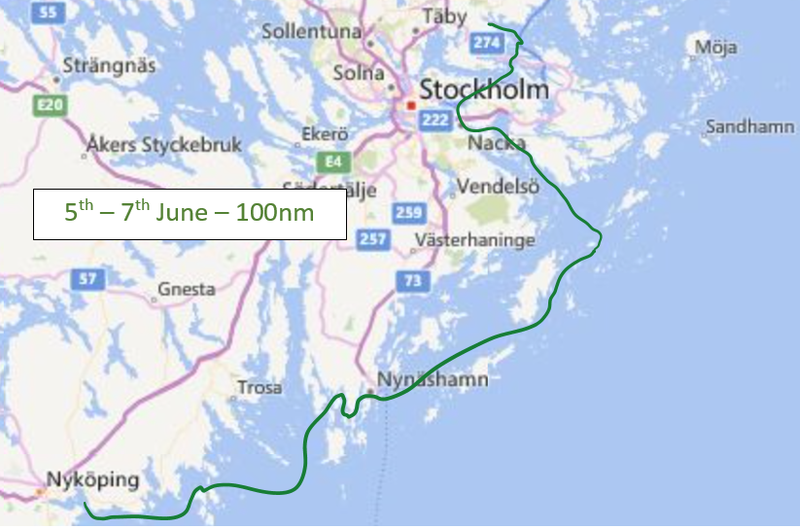 Our worst experience: gradually seeing every piece of electronic navigation aid fail as we crossed the major shipping lanes in the Baltic and then having to turn into lumpy sea and beat to a harbour with a safer entrance. Our favourite harbour: Utklippan – a tiny desolate rocky island 12 miles offshore from the Swedish Coast – with its ochre lighthouse and nesting birds. Which has a heart stopping narrow entrance. See the other banner picture. NM sailed 1502m. Peter and Chris sailed 716m to Kiel and we sailed the rest. Night hours: 8….. it is never really gets dark here in the summer. Fuel used – good question – we still haven’t got our fuel gauge working. Starting Point – Mylor Marina, Falmouth UK. Finishing Point – Svinninge Marina Stockholm, Sweden. Number of weeks before we could say the name of our current marina and not have a Swede say where.. at least 6. Number of rocks touched: 1 + marina pontoon anchor stone….which considering the charts have areas marked – known rocks above 6m depth marked – we are very relieved about.